He designs experiments to research the innate capacity for empathy in primates. If you give chimpanzees a free choice between helping only themselves to food or helping themselves plus a partner, they prefer the latter. Interestingly, when this partner demands attention by making noises and spitting, the motivation to feed it quickly diminishes. 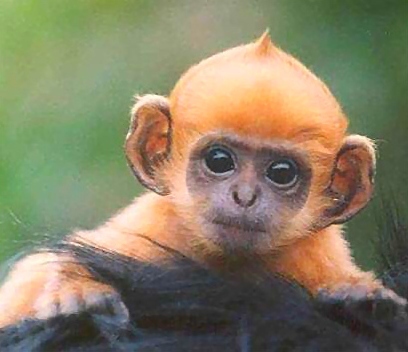 In this short fragment on youtube, De Waal shows us how capuchin monkeys reject unequal pay. They are not happy with a piece of cucumber when another gets a grape. In the past, ethologists often focused on competition between animals. I suppose we could recognise that as just another example of anthropomorphism. After all, we usually associate only our bad behaviour with the animal in us. Instead De Waal has spent many years looking at reciprocity, empathy and conflict resolution. In his book: “Primates and philosophers”, De Waal argues against what he calls the ‘veneer theory’ of morality. According to De Waal, we descended from highly social ancestors and have been living in groups forever. Our survival has therefore depended on cooperation and coordination. 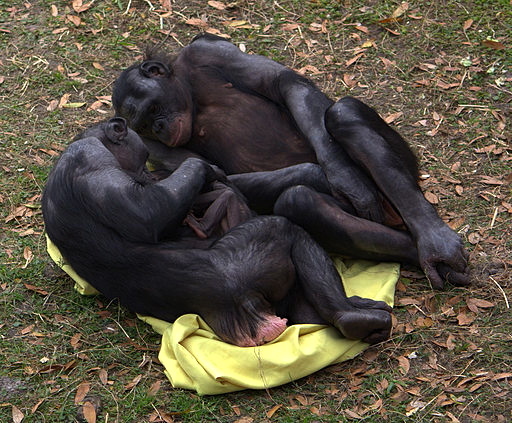 After an aggressive conflict between two chimps, a bystander will often console the ‘loser’ of the conflict, for example by putting an arm around him. In such cases of consolation, there is no clear benefit for the consoling party. According to De Waal, there is a Perception-Action-Mechanism (PAM) at work. Here, the observer has access to the emotional state of its object through its own neural and bodily representations. The closer and the more similar the two animals are, the easier it is for the subject to ‘get under the skin’ of the object, sharing its feelings and needs. This in turn fosters sympathy, compassion and helping. The existence of PAM is evolutionary explicable and natural selection of the PAM could have brought on a concern for others that transcends self-preservation: a moral concern. A few commentators react to De Waal’s findings. Some of them do not agree on the extent of altruistic tendencies in primates, but all agree that he revealed an empathic response in non-human primates that merits serious attention. I’ve found one historian who mentions that we should not forget that it’s 5.5 million years ago that hominids branched off from their ancestor. If people have since evolved, so have apes. Others argue that the observations do not prove that what De Waal observed in animals are in fact the fundamental capacities, the building blocks underlying moral agency. It also does not prove chimpanzees make moral judgments, that they actually have a notion of right and wrong. Philip Kitcher, for example, will only concede that non-human primates can be motivated by involuntary, empathic emotional impulses. They cannot reflect on these impulses and therefore don’t demonstrate moral agency. It is possible that this rebellion started earlier than he expected. This entry was posted in atheism, book review, science and tagged chimpanzees, empathy, evolution, Frans de Waal, morals, philosophy. Bookmark the permalink. I just wrote a piece on morality on my blog, if you want to check it out. Less scientific, though. Reblogged this on things temporarily hidden. A lovely post, especially the link to the capuchin video! This is a really good summary of what I’ve been trying to explain to some theists, so thank *you*! That makes me think of Tonguesandwich, where he mentions being vegetarian because he hates plants. 😉 I remember reading that trees can send each other messages by producing certain chemicals. They would do that to ‘warn’ others about the presence of certain insects, for instance. They would then proceed to make certain kinds of poison to protect themselves. It would be interesting to explore that further. I can imagine cooking for a family makes it more difficult. My main problem is wondering if I should tell people who invite me to dinner. 😉 Cognitive dissonance can be a good thing, I think. Especially if you experience such nasty, physical reactions when thinking about it. I’m almost sorry for bringing it up…. 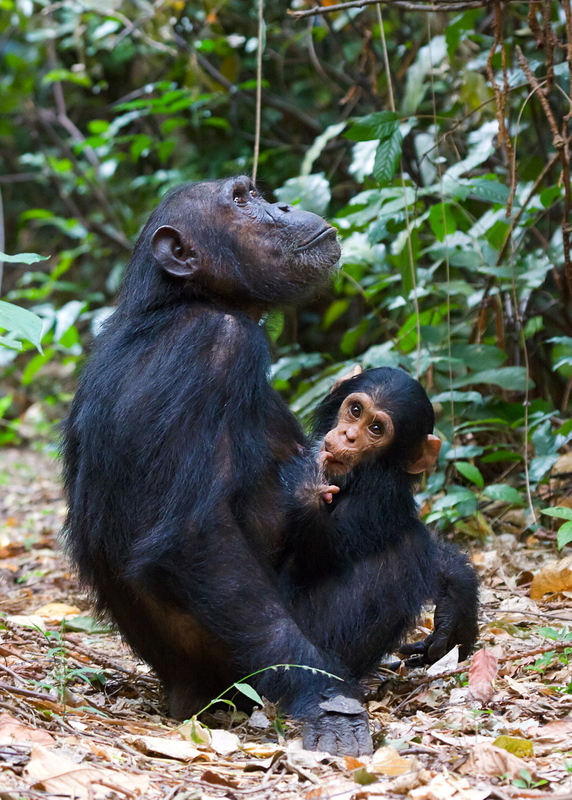 Great post, De Waal is my favorite primatologist. The argument from morality is in fact the last resort for christians (and other theists) for justifying their immature beliefs, since they know that science is closing down their god of the gaps. By claiming that morality is outside the realm (NOMA) of science they hope the isolate ethics from being occupied by atheists. What christians do not know is that non-theist ethics is at least thousands of years old and is an essential part of both Indian and Chinese philosophy (and law). There is a further complication with this resort to morality, namely the assumption that morality is necessary. One wight wonder why we should be moral in the first place. Additionally, there is also the question why god should care about human morality. Indeed! Personally, I have never understood what god would have to do with our morality. If you only just start thinking about it, there are many problems with the idea that god is an omnipotent superbeing who has designed us and gave us free will etc. And don’t get me started on why we should make an assumption that morality is necessary! I would need a whole post to properly comment on that. So for now, I will just agree with you that this is another interesting addition to the discussion. 🙂 Unless, of course, you would like to elaborate on that. I do not believe there are true necessities in life. The assumption of the necessity of morality stems from the desire for some kind of morality, and evolutionary biology is perfectly able to explain this desire. The point is that people are not able to distinguish between their desires and necessities. Wow! That’s a bold statement. I really like it. It makes me think of the buddhist view that our desires are the problem. (I am thinking of a philosophy here, not trying to exchange one religion for another.) Do you have a certain philosophy in mind when you write this? Your response is funny, in a good sense, because I consider myself as buddhist. However, I didn’t have a particular philosophy in mind when I wrote my last comment. Of course, my thinking is influenced by my previous experiences and thoughts. Whatever name you use, we should focus on arguments and reasoning. Only many people have difficulty with grasping the difference between form and substance. I feel the same way. Actually, I have taken a holiday from buddhism to look into western philosophy for a bit. (I’m shamefully ignorant about that.) And I am amazed by the clarity of much of what I am reading. With buddhism, I often found it very difficult to imagine the frame of reference the author would have had. It’s often difficult to see the difference between philosophy and culture. For instance, what could have inspired people to discern the five skandha’s the way they did? Well, I was just going to write a post about this! Looks like I won’t have to. I’ll just link to this instead… Apparently there are other animals who seem to have a sense of fairness, like dogs or even crows. I read about it today. It makes sense: once you have big groups, some kinds of behavior will be rewarded. I think the points above rejecting that as morality “because there’s no reflection” are moot. Reflection comes after morality, to try to make sense of something we’d be doing anyway. Is morality acting morally or thinking about how to act? To me, morality is just acting according to some set of rules (implicit or not) that regulate cohabitation. And animals do it, that’s for sure. Maybe they can’t talk about it, but that’s it. I’ll definately want to read this, it sounds very interesting indeed. I’ve always felt that we’ve not gone very far morally speaking since we’ve begun our evolution from our cousins…I’m putting this on facebook (my filing cabinet for interesting things) so I can reference it and read it more carefully later. Thanks, interesting as usual! It so happens that I’m just reading a book on this very topic – ‘Moral Minds’ by Marc Hauser. The thesis follows a suggestion by the moral philosopher John Rawls making an analogy with our capacity for language. As I expect you know, Noam Chomsky proposed that we have an innate capacity for language which determines fundamental linguistic structure, while on top of that there are geographical and cultural variations in the forms of rules, referred to by linguists as ‘parameters’. The idea is that morality is just the same – an innate set of basic moral precepts which have biologically evolved, but overlaid with further rules that vary according to culture. Hauser examines the idea in detail, using much interesting scientific and anthropological detail. Oddly, since writing this book on morality, Hauser has been charged with scientific misconduct and has resigned from his position at Harvard – the details were never released, but the suspicion is that errors were involved, rather than outright fraud. But I’d recommend the book, and you’d never suspect any of that from reading it. Thank you for mentioning this! It looks like yet another, very interesting take on the development of our morality. 🙂 I am familiar with Chomsky of course, but I had never heard of Marc Hauser. Very well done! I’m saving this into my ‘special’ file for all future reference. It’s important to read definitions carefully with Dawkins. I don’t have my copy of Selfish Gene handy but, if I recall correctly, he uses ‘selfish’ as an outcome-focused quantity rather than an emotional attitude for most of the book. Thank you for your comment. I do have my copy of the Selfish Gene handy but I think I can agree with you without looking it up. It was not my intention to ‘prove Dawkins wrong’ on the basis of one short quote. On the contrary. I was just using this as an example of the way many scientists look at humans as being very different from non-humans. Exactly. The discussion about trees, for example. Next post? That would be great! Is that your next post or mine? Aw! I don’t see it that way. 😉 And what about reading you on dogs, morals and souls? That might be interesting! I enjoyed your views on the bases of morality and found them very insightful. Great post. I was searching for some background as I move forward with my own blog. I am taking a more philosophical approach and trying to discover what the major cause of the decline in morals and values are. Thank you for posting this and I look forward to your future posts as well. I have noticed that as our knowledge of animal intelligence and social behaviour increases, we realise more and more that much of what distinguishes as humans from animals is not that we are the top species, or even a chosen species, but that we are simply more arrogant and ignorant than the rest. What makes us think that we can outsmart any species that has survived longer than we have? Cockroaches come to mind. They were there before us and they will still be there when we have wiped ourselves out. Even a potato has twice as many genes as humans. Van der Waal really help us come to terms with ourselves. Great post LivelySceptic! Thank you very much for the reblog, Jusd! Dearest Livelyskeptic, I’ve nominated you for the WordPress Family Award…for more information pls read: http://bastetandsekhmet.wordpress.com/2013/04/22/newsletter-awards/ (no questions to answer et al) and no obligations…I interpret as an award for those who I comment with etc. Ta! 🙂 I love that blackbird…reminds me of my friendly morning blackbird outside my window! Glad you liked it.